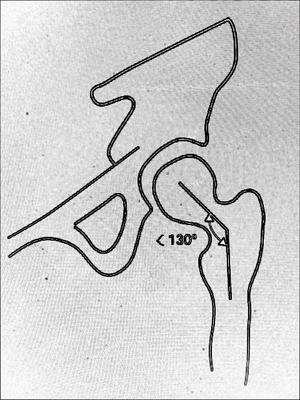 If the angle of inclination of the femoral neck to the shaft in the frontal plane exceeds 130 degrees then it is known as coxa valga; an angle less than 130 degrees is known as coxa vara. The angle of inclination ( i.e angle formed between axis of head/neck and the shaft of femur) averages 126 degrees. It ranges between 115-140 degrees in normal adults. The femoral head is spherical in its articular portion that forms two thirds of a sphere. The diameter of the femoral head is smaller for females than for males. In the normal hip, the center of the femoral head coincides exactly with the center of the acetabulum. The rounded part of the femoral head is spheroidal rather than spherical because the uppermost part is flattened slightly. This causes the load to be distributed in a ringlike pattern around the superior pole. The geometrical center of the femoral head is traversed by the three axes of the joint, the horizontal axis, the vertical axis, and the anterior/posterior axis. The head is supported by the neck of the femur, which joins the shaft. The axis of the femoral neck is obliquely set and runs superiorly, medially, and anteriorly. The angle of inclination of the femoral neck to the shaft in the frontal plane is the neck-shaft angle. In most adults, this angle is about 130◦. An angle exceeding 130◦ is known as coxa valga; an angle less than 130◦ is known as coxa vara. The femoral neck forms an acute angle with the transverse axis of the femoral condyles. This angle faces medially and anteriorly and is called the angle of anteversion. In the adult, this angle averages about 7.5◦.